OR 12 MILES EAST OF MINERAL POINT, MOVING EAST AT 55 MPH. VERNON, YELLOWSTONE LAKE ST PARK AND PAOLI. John Matthews, executive director of Madison Teachers Inc., is in the spotlight over collective bargaining rights and the MTI contract. John Matthews, executive director of Madison Teachers, Inc. This story appeared first in the Sunday edition of the Wisconsin State Journal newspaper. During a recent Madison School Board meeting, with more than 300 of his members packing the auditorium, union leader John Matthews felt a twinge of exhilaration. The issue - unhappiness about a reduction in personal planning time in exchange for school-wide staff development in the new teacher contract - mobilized the kind of teacher turnout not seen at board meetings since the mid-1990s when labor strife was more common. Teachers reminded the board that planning time was a key issue during a 1976 strike, which Matthews helped organize. "They're ready," Matthews said afterward, "to do whatever it takes." After 43 years as executive director of Madison Teachers Inc., Matthews is in the spotlight again after encouraging a four-day sick-out that closed school in February. The action allowed teachers to attend protests at the Capitol over Gov. Scott Walker's proposal to curb collective bargaining by public employees. The matter remains in the courts, but it prompted a hasty contract negotiation between the district and union. Teachers aren't happy about some of the changes, and Matthews is preparing for a street fight. "It's going to get down and dirty," Matthews said, alluding to the possibility of more job actions, such as "working the contract" - meaning teachers wouldn't work outside required hours - if the School Board doesn't back off changes in the contract. "You can't continually put people down and do things to control them and hurt them and not have them react." Moreover, the latest battle over collective bargaining has taken on more personal significance for Matthews, whose life's work has been negotiating contracts. 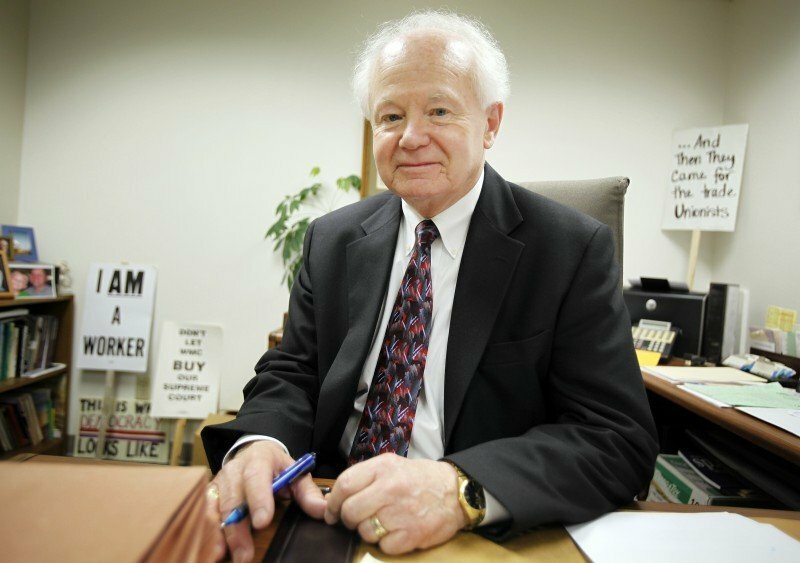 "It would be like somebody watching all their paintings burn up," longtime Madison labor mediator Howard Bellman said of the possible success of Walker's plan. "What he's accomplished over the years would have been just a memory." Matthews came to Madison in 1968, and though no official records are kept, is possibly the longest-serving director of a teachers union in the United States. At 71, he gives no indication he plans to retire soon. Bellman describes him as "a classic, orthodox American unionist." Matthews was born and raised a devout Catholic Democrat two blocks from the state Capitol in Helena, Mont. His childhood values - a belief in good and evil, right and wrong and workplace justice - still shape his world view. His grandfather and namesake was a Montana Supreme Court justice and his father was a state budget director. His mother, when asked for voting advice, would say, "You just look for a D and put an X next to it." As a teacher and union negotiator in Billings, Mont., Matthews won a primary election for a state legislative seat in 1968, but withdrew from the race when he took the job as MTI's first executive director. Two years before he arrived in Madison, the union ratified its first collective bargaining agreement - a four-page document. Within 15 years the agreement grew to a 150-page booklet that teachers here considered one of the best in the country. "At that time we were a growing organization and we needed someone to come in and give us our direction," said Judy Middleton, MTI president when Matthews was hired. "He came in and got everybody organized." His devotion to teachers and negotiating prowess earned him the adulation of his members. Behind his blustery public persona is "a man who makes the phone calls, sends the cards and stops in at the hospital" when his members are sick, current MTI president Peggy Coyne said. When teachers aren't performing to par, Matthews often gets involved, making sure they receive peer training. He still regales new hires every year with the story of how when he started, pregnant teachers were forced to resign and non-Christians couldn't take off their religious holidays. Matthews has had plenty of critics over the years. Former MTI president Kate Conklin, who retired from teaching in 2005, said in the past the union has been weakened by not collaborating more with other teachers unions. She advocated for giving more power to the elected board and less to MTI staff, but was always in the minority. "I think we could learn a lot from those other bodies," Conklin said. "We assume a kind of arrogance that comes through most clearly in John's approach to people and issues." In 1993, he was scrutinized for holding a paid position on the board of directors with Wisconsin Physicians Service, one of the school district's health insurance providers. The state insurance commissioner cleared him of any legal conflicts, but questions lingered about whether the arrangement presented a conflict of interest. Matthews rejects that notion, saying in surveys of MTI members, keeping WPS insurance as an option consistently ranks as the top priority. The recent contract, however, allows the district to drop WPS as an insurer in 2012. Lately, his comments lambasting the district and School Board over contract negotiations have caused some to question his relevance. School Board member Maya Cole criticized Matthews for harboring an "us against them" mentality at a time when the district needs more cooperation than ever to successfully educate students. "His behavior has become problematic," Cole said. "In his mind he is doing the right thing. But he doesn't see that in the political process, he's preventing good people from coming forward and running for office for the right reasons." Board member Ed Hughes recently wrote on his blog that teachers unions "aren't all that necessary" because the district isn't "running a sweatshop." "It may be that John Matthews' ramped-up rhetoric is best understood not as a protest against school district over-reaching in bargaining, since that did not happen, but as a cry against the possibility of his own impending irrelevance," Hughes wrote. "Teachers unions are part of the solution," he said. "When you have a balance of power between labor and management, you should be able to work things out." For years, MTI and Matthews exerted strong influence over the School Board, according to former board member Ray Allen. "The district has been to a large degree the junior varsity to John's varsity in negotiations," Allen said. But Walker's collective bargaining measure shifted the balance in favor of management. Schools observer T.J. Mertz said the recent contract negotiation is the first time in his memory where "John did not come out a clear winner." "Therefore he needed to restore the confidence of his members," Mertz said, referring to the turnout at the recent School Board meeting. "He needed to show his members their own power." In the latest contract negotiation, the union found its back against a wall. If it didn't settle before the collective bargaining law took effect, the contract would be void and the district could unilaterally set workplace rules. The union also would lose the ability to automatically collect dues from teacher paychecks to cover its more than $2 million annual budget. The union entered negotiations expecting to make concessions on wages and increased employee contributions to pension and health insurance. But what angered Matthews and his members was the district sought other concessions unrelated to finances. That included changes to elementary school teacher planning time, the issue that brought hundreds of teachers to the recent School Board meeting. Currently elementary teachers have two hours of planning time on Mondays when they grade papers, meet with parents and perform other duties they might otherwise have to do at home. The new contract allows principals to hold staff development meetings during that time. Teachers didn't have all the details when they ratified the contract, Coyne said. She doesn't blame Matthews for the contract's shortcomings, but rather the hasty negotiations brought about by the collective bargaining law, which was struck down by a Dane County judge. Its implementation is uncertain. Matthews said a teacher walkout or other collective action will depend on whether the School Board addresses their concerns. Teachers "have been very polite so far," Matthews said. "But when the cup runneth over, it's going to be a different ballgame."